The New York Times published a piece about helicopter parents making obvious and easily detectable edits to college essays. Once you recognize that your job as an editor is to improve writers, not just writing, you won’t do stuff like that. 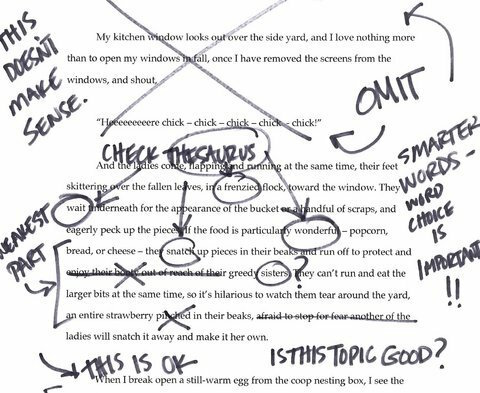 The paradox of the overzealous editing of the college essay by many helicopter parents is that they don’t know what a college essay is really about. Unlike the other parts of the application, where high grade point averages and SAT scores reign supreme, the essay is less about being impressive than it is about being authentic. . . .
Parents, when you mess with your kids’ pure voices, you’re actually co-writing terrible college essays. And far more egregious and dangerous: You’re teaching your children that when the stakes are high enough, it’s O.K. to be unethical and possibly a plagiarist. I have two children, one of whom has completed college, and one who will entering shortly. Did I edit their essays? Of course I did. I’m a professional writer and editor, and I want to them to have the best possible chance to get into college. Asking for help to improve your writing is not plagiarism. I use copy editors. My clients tap my editing skills. When I was an analyst I edited what other analysts wrote, and other people edited me. None of this was unethical, nor did it undermine the credit that the author deserves for their own ideas. I point out errors, elements that are difficult to understand, structural problems, and weak ideas. I suggest ways to rewrite problematic phrasing like passive voice and the excessive use of over-the-top adjectives. For any but the most obvious problems, I make the writer go back and fix things. These principles require the writer to think. It is a lot easier to just edit the text. But when you do that, the only thing that improves is the text. In the workplace, that’s a shame. In a college essay, that’s a crime. When you identify, not just what’s wrong, but why, and force the writer to think, you are improving the writer, not just the text. This benefits not just the text and the writer, but every person who reads that writer’s writing in the future. It’s more work but it’s well worth it. If writing teachers in high school did this more frequently, we’d have a lot better writers writing college essays. You have no idea how much I don’t want to make myself a “college essay consultant” — that sounds hellish. But I enjoyed teaching homeschooled high-school students writing, with a heavy emphasis on editing. And we did practice college essays in my class. Every one of those essays sounds like the student, not like me. They’re better writers now. But the ideas, the tone, and the words in what they write come from them, not from me. Well put. Many of the same points could be said about a person’s resume. Get assistance. Have it reviewed and proofread. At the end of the day it still needs to be your own voice.